Our journey from Greensboro, North Carolina, to Atlanta, Georgia, began at 4 a.m. We had gone to obtain traveling papers at the Nigerian Consulate to enable us visit West Africa. Something painfully disquieting and dubious struck home as soon as we wheeled into the premises. A feeling of motion without movement was palpably present. All parking space was used up except one by the dumpster, so I went for it. I soon realized why everyone avoided it like a patient struck down by a full viral load of Ebola. 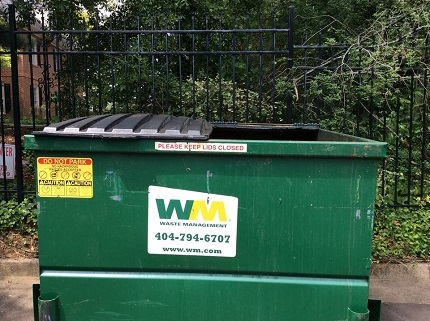 The dumpster carried the sign: Please Always Keep the Lids Closed. There had been two lids. One remained closed, held together by grime. The other had caved in. It had become integrated with the garbage and lost way back in time. So the sign on the dumpster reeked of redundancy. Its dissonance smacked of an awkward affront to dignity. Flies frolicked jauntily from the open half of the dumpster. An unyielding noisome stench oozed steadily from it. The noxious odor explained why the scavenging insects were furiously clawing themselves like a pack of famished hyenas tearing at a decomposing carcass. The conceit was too poignant to miss, so I started taking stock of the pretension to decency. It compared favorably to the diseased, institution-less democracy parodied back home. Worse, the uninviting sight evoked degraded environments that give Ebola and other grim contagions license to flourish in West Africa. The remark aggravated my embarrassment as milling folks who had missed my stumble now took interest. Some said “Sorry o!” Nigerians traditionally say sorry whether or not they are responsible when someone is in a situation. It’s our way of expressing sympathy or simply urging caution. By the time we got inside, the uncanny logic of the dumpster made itself fully felt. 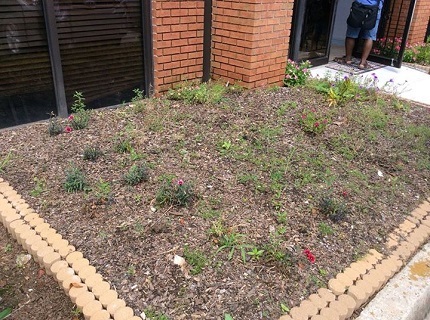 At the entrance to the two-story building is a drab, dirt-whipped flower garden. The plants are parched, scrawny, stunted and dismayed by neglect. No one cared what impression intending visitors got from the shabby consulate. Apparently stagnation was sacrosanct and compelled everything to its service. The garden at the Nigerian Consulate is so parched one would almost think the Nigerians had to pay for rain. Inside, I noticed to the left, a small waiting hall designed to hold twenty five people. That day it probably held more than twice that number. I gathered that though appointments were made online, applicants could, however, do a walk-in. That explained the overcrowding. It was an innovation with doubtful value. 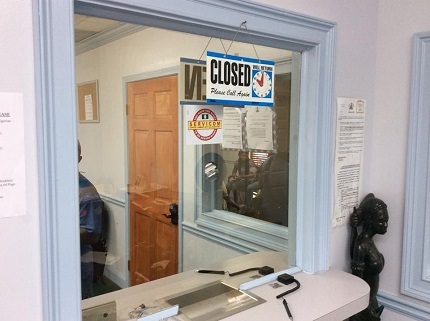 The United States Immigrations appointments for biometrics have no room for walk-ins. Perhaps that is why business moves so swiftly that it fixes in fifteen minutes what its Nigerian counterpart does in six hours. In the building, those who arrived early had taken up the few available seats. Others leaned on the wall. Yet some queued while others, with typical Nigerian improvisation, took up positions on the red-carpeted staircases or simply sat on the floor. Since there was no official to guide us on how to proceed, we asked the folks who had arrived earlier. They directed us to take a number from the wall and wait for an official in an adjoining cubicle to call us to check our documents. We did. A sign hung on the cubicle read, “CLOSED,” even though a pleasant mannered woman of indeterminate race was busy attending to the boisterous crowd. Apparently someone had neglected to flip over the sign to “OPEN.” I saw in the failure a comment on a country with closed, drubbed institutions in yet in need for openness, systemic reforms, transparency, consistency and stability. Is it closed or open? The simple sign could be a metaphor for a country. Having sat all morning driving, I was hard-pressed to use a restroom and asked for one. 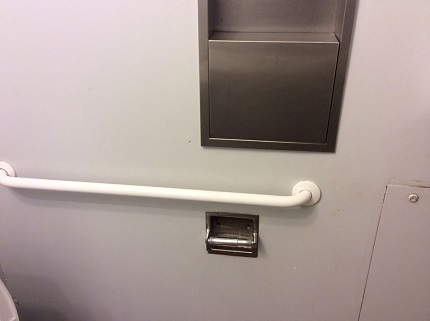 After relieving myself, I turned to where the toilet roll was supposed to be. There was none! I panicked. Tina was right about my lack of situational awareness. In my predicament, I realized how stupid I was for not showing more presence of mind. Thinking quickly as I sat on the toilet, I reached for my cellphone and called my wife for help. Fortunately she had something in the car that saved me from the painfully mortifying situation. Turning to wash my hands I noticed the soap dispenser was long broken and worse, there was no soap. I came out flaming. Seeing my family, I swallowed my fury and faked a gentlemanly smile. Searching out an official, I reported the situation. He made a show of apologizing to me and promised immediate action. Two hours after, nothing had changed. An African-American lady married to a Yoruba Nigerian had escorted her twin daughters to the women’s section of the restroom and was just as unnerved finding that there was no toilet paper there too. She came out storming. Her outburst changed nothing. The restrooms in the Nigerian Consulate were all form, no function. If the reception room ached with anxiety, the room we waited for the biometrics throbbed with maddening frustration. After dropping our document at an open window marked for it, we sat for four long, boring hours unattended to. The cooling system was in disrepair. People murmured but none confronted the abuse. An infant tended by its grandmother protested the heat by bawling its guts out. Having earlier overheard her speaking a tribal Nigerian language I understand, I walked up to her and offered to take the baby outside for fresh air. Relieved and surprised I spoke her language, she thrust the agitated fellow into my arms and straightaway started nursing her hurting knees. Outside, I cooed some grandfatherly sweet nothing into the ears of the kid and it rewarded me with a smile. While at it, I saw a clerk doing brisk business with those desperate to be attended to ahead of others. An hour later, the baby’s mother done with her biometrics, she got back her child. Several hours later it was our turn to be called in. The reason for the unnecessarily exhausting wait soon dawned on us. Affairs appeared under-resourced and the officials showed no sense of duty. Instead, they took their time cracking lewd, tribal jokes and laughing at the brilliance of their wit. Done eventually, we sought a place to cool off. Mission Restaurant is a few blocks from the Consulate. Mostly those who did business at the consulate retired there. The food was so good and very home-like people quickly forgot the needlessly long wait at the consulate. They now turned attention to politics back home. Their scapegoat was President Jonathan and the quirky grammar of his wife, Patience. They thought the president should resign because of his wife’s penchant for grammatical curiosities. Though I disagreed with the skewed analysis of my new friends, I joined in their uproarious laughter. I needed it for the six-hour drive in the night back to Greensboro.